This three night journey into the Parc Nacional des Volcans is an experience not to be missed. 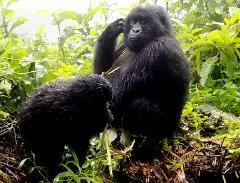 The stunning scenery, interaction with the Gorilla families and warm hospitality of the Rwandan people make this an incredible safari. Track both of Rwanda’s great apes – mountain gorillas and chimpanzees – and see some of the country’s other specialised and striking primates as well.